Do the HOS speak a dialect or a language? The oldest painting of the HO country: Army marching near Chaibasa, 1841. The spread of literacy to the masses is arguably the most far reaching cultural change of the last two centuries. One of the first countries where this took place was Great Britain. 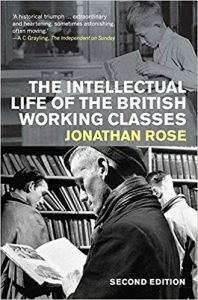 Jonathan Rose’s The Intellectual Life of the British Working Classes uses much autobiographical material to tell us how the workers experienced their quest into written knowledge, roughly from 1760 to 1960. It is a historians’ history, packed with information and references. It transforms our understanding of a driving force behind intellectual history. The urge to read literature did not come from the invisible hand of the market, from the pressure of government or even from education, but from the urge of working people themselves to understand where they stood in the world, and, most importantly, to become an individual. It started as an autodidact movement. Initially, individual workers, often wretchedly poor, had to make do with religious tracts, old newspapers and second hand books. First they had to develop an understanding of literary conventions, like the distinction between a factual and a fictional account. From about the middle of the nineteenth century mutual help became the norm. In clubs and production sites workers discussed often amazingly sophisticated literature, even when they also read what we now would call pulp fiction. The Education Act of 1870 was followed by universal compulsory education. In historiography schools often have been put down, but many children liked their heated and clean school buildings, a far cry from conditions at home. As teaching materials were out of date, being an autodidact continued to make sense. The highpoint of autodidact culture and the mutual help societies was in the years leading up to the first world war. It encompassed about 25% of the working population. The classics came in its reach in series of cheap editions. The working classes seemed to be catching up. In retrospect all though this period there was a 20 year gap between the latest developments in literature and what the workers got into their hands.In that light, the way in which Rose treats Bloomsbury is surprising. Coming to the fore after the First World War, Bloomsbury’s writing could not be grasped by working people who were used to Victorian modes of expression. Rose has little good to say about the Bloomsbury group and his nemesis Virginia Woolf. Bloomsbury, while professing to be Bohemian, looked down upon the workers, and, even more revealing, was dead set against the shallow intellectual and literary life in the new suburbs to which socially climbing workers went. However, autobiographies and interviews show that intellectual life there was not dull, and that people read a lot. Even those who entered office life could find there a great deal of discussions. Thus, by the 1930’s- 1940s, there were two rival intelligentsia, the middle class, modernist and elitist; and the working class more classical in outlook, and politically leaning towards labour. Domestically, cultural conservatism could go together with political radicalism. Marxism did not catch on in the UK. Working people often saw Marxists as condescending and engaged in irrelevant discussions. It did not fit in with the Practical Christianity that was the norm. International developments did not mean much to them, either. Schools transmitted only hazy notions about the world outside Britain, and even about the Empire. After World War II, especially in the 1960s Bohemian culture bounced back, and got a mass following, also among the working classes. Even though they might like movies, radio and TV more, all of these people were literate. Instead of stopping at this change of medium, Rose moves on to make political statements about the present. He has no good words for university intellectuals who spread the idea that `all subcultures are equally valuable’. He has a point with sociology, a branch of academia that with its jargon has painted itself into a corner. But he misses the point with his equally loathed Bohemian mass culture of the 1960s and later. The last fifty years Bohemia offers people expression of what goes on in their lives, a burning need in a vastly expanding world. Here literature has been overtaken, even though it is by no means dead. Rose’s book shows popular demand and action as the engines of intellectual life of the working classes of Britain. A like demand and action, but of course under different circumstances, can be witnessed in the countries of the south. Rose gives us much to read and much to ponder. The spread of intellectual life among the working classes is by no means over.